Several years ago, I became interested in medium wave DXing. One of my limitations was the size of my yard, so I developed an interest in tuned loop antennas to compensate, because setting up a beverage antenna was out of the question. I experimented with different sizes of loops, and found that the bigger the aperture, the more gain the loop would have. The tuned loop antenna is also very directional, which allows you to reject, or null out interference from either noise or other stations. Loops are considered bi-directional in that they receive to the front and back, but not to the sides. The tuned loop antenna quickly became my weapon of choice for medium wave DXing. Recently when the weather began allowing me to enjoy the outdoors, I decided to make another smaller loop antenna from a plastic milk crate I had lying around. I saw the idea on the internet when I observed that someone had used a milk crate for their loop. Click here to see a variety of tuned loop antennas that others have made. Whichever material you decide to make your loop antenna from, just make sure that it is not a conductive material. Wood, plastic, and cardboard seem to be popular materials for loop making. In the photo above, I am using my Sony ICF-2010 to listen to WCCO on 830 kHz. This station is nearly 200 miles south of me, but I am able to receive it with 9 LEDs lit on my signal strength meter while using the loop. There is no direct connection of the loop to the radio, it is inductively coupling with the radio’s own ferrite rod antenna. 1 – Tuning knob. Any knob will do as long as it fits the shaft on the variable capacitor. 1 – Tape or wire ties. I used tape to secure the wire while winding, then hot glue when finished. When you begin to wind your coil, use tape or a wire tie to secure the wire, and leave about a foot of wire. This extra foot of wire will later be soldered to the frame on the capacitor. As you wind your coil, pull the wire snugly and with each turn leave about a quarter inch spacing between each turn. The spacing isn’t critical as long as the spacing is consistent. I wound 21 turns on my crate. This may differ for you, depending on the size of your crate, or the value of you capacitor. If you find that the bottom frequency isn’t low enough, you can add more wire to make a few more turns. This will lower the bottom frequency for you. After winding the coil, you can solder each end of the coil to your capacitor. The beginning of the loop gets soldered to the frame of the capacitor, and the other end of the coil to the rotor solder lug on the side of the capacitor. If you do not have a soldering iron, you can use alligator clips to connect your loop coil to the capacitor as well. I secured my capacitor to the inside corner of the crate with hot glue. I put a generous amount of the hot glue onto the bottom of the capacitor frame, and held it to the crate until the glue cooled enough for the capacitor to stay on it’s own. I used enough to get the job done, but not so much that it interfered with the plates in my capacitor. The hot glue seemed to adhere very well. I then checked the spacing of my coil turns, and secured them with the hot glue as well. I was very impressed with the results after spending some time with the loop. It’s small enough to maneuver around easily, but big enough to give it some gain, so I can listen to daytime DX. I may make another tuned loop using two crates to see how much more gain I get with the larger aperture. Many thanks, James, for sharing your project with us! This loop appears to be relatively simple and accessible even to those with little knowledge of soldering or homebrewing. I’m now wondering how a loop made of four milk crates might perform! 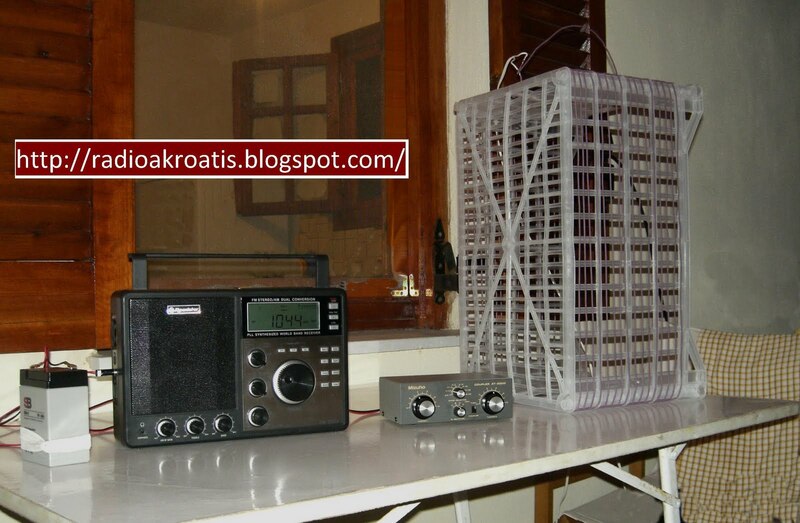 Click here to view James’ Shortwave/Medium Wave blog. This entry was posted in Accessories, AM, Antennas, Articles, Guest Posts, How To, Mediumwave, News and tagged AM, How To Build a Mediumwave Antenna, James Townley, Loop Antennas, Mag Loop Antennas, Magnetic Loop Antennas, Mediumwave, Milk Crate Loop Antenna on June 8, 2017 by Thomas. Last night these photos have already and at last motivated me to refurbish my “international” 2010, a little, it had that “Energy 3 problem”, which a white eraser, slight contact bending by 1 mm and good screws-tightening has finally fixed. A good hour of (slow) work. I am now determined to build such a crate loop myself, for the 1600 khz pirates and the 160 m amateur band if possible. Frank, That’s great to hear. I love the ICF-2010. I just acquired another 2010 to have as a back-up and for travel. They just don’t make them like that anymore. I have also used a 1 meter box loop with great success. I fed it directly to my receiver with a one-turn coupling loop to a twisted pair to the receiver. It’s so much fun to experiment. 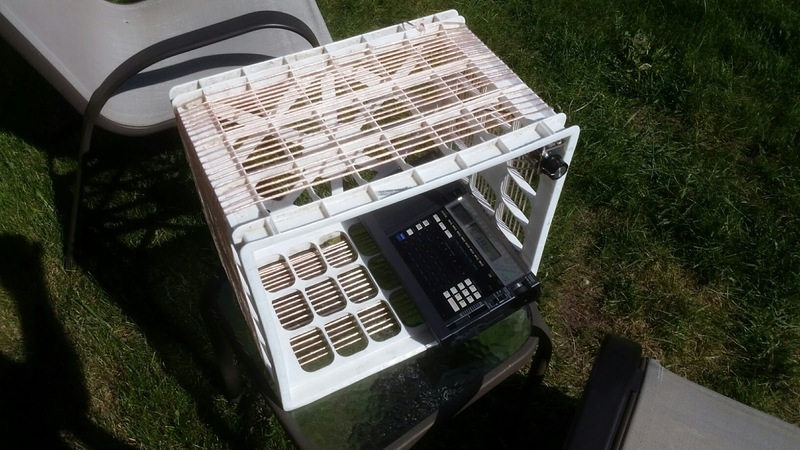 I appreciate your post about the milk crate loop antenna. I’d like to build one, but could you elaborate for a beginning antenna builder your hook up to the set “with a one-turn coupling loop to a twisted pair to the receiver”? I constructed a similar crate loop antenna but I tuned the coil with an antenna tuner. So, I avoided the problem of matching the number of turns with capacitor’s values. The result is a directive antenna. I have a photo of the whole configuration. To double the diameter of the milk crate loop, you would need 4 milk crates. First connect them firmly to each other using long/wide nylon tie wraps. Then you can hot glue along the seams, if you want, before starting the winding process. You mention that you can add a few turns of the wire to tweak the LF response. How sensitive is the number of turns when dealing with LF ? There are formulas available to calculate the inductance needed, but I just experiment with the number of turns. I have found that depending on the upper and lower values of my variable capacitor, if I go with too many turns, I lose the upper end of the band. This is a very old concept that has come back to life, With every man and his dog building loops these days, it is a real pleasure to see this method reinvented again and I hope it catches on with new SWLs as well as us ‘Crinklies’ Thank you. Yes, I’ve seen it before, except using a cardboard box. Not so good if using outside and it starts to rain. On the other hand, seeing the comment below about a larger loop, if you get a new large appliance there’s the box for a bigger loop. And you can sit inside the box with the radio, immersed in the stronger signals from the loop, and shade from the sun. Or if in Alaska, some level of shelter from the wind.